Browns Investments PLC has acquired 51% stake in 'Green Paradise', the newly built luxury hotel in Dambulla for Rs 500 million. Built by an Italian group on a 14-acre block, the eco-friendly luxury had been in operation since June 2012. 'Green Paradise' has 67 luxury eco-villas comprising 40 superior duplex, 10 garden suites, and 17 deluxe rooms. The spacious superior duplex rooms are ideal for guests who love extra space, with the living room on first floor and bedrooms downstairs. They are equipped with all facilities for a comfortable stay. Offering complete privacy and secluded luxury, the garden suites are semi-detached units consisting of two suites per unit, all with interconnecting doors, ideal for large families or groups who wish to have their own private space. The Deluxe rooms are about 35sqm furnished with queen size bed, teak furniture's, shower with private bathroom, television, air conditioning, mini bar, safe box, tea and coffee facilities and private veranda. The main building of the hotel with a total floor area of 38,000 sq ft. in three floors, comprise two restaurants with excellent cuisine - the Orchid where breakfast, lunch and dinner are served and the Salt &Pepper which is opened from noon until evening for snacks and light meals, and thereafter for dinner. While the Blue Elephant bar presents various cocktails, the large swimming Pool with the'Pizzeria Al Forno' bar is located by the poolside where the visitors can enjoy traditionally prepared pizza. 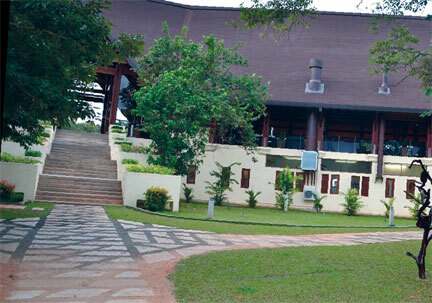 Green Paradise is also equipped with a modern gym, spa center, a shopping arcade, wi-fi and internet connectivity, sports area which includes a large sports ground where even cricket matches can be played, supporting agro-eco life by cultivating fruits and vegetables within the resort, night entertainment with light music programs, weekly fashion shows, and traditional cultural programs. The hotel is close to the Kandalama tank, the cultural triangle, the Dambulla rock temple and other cave temples in the vicinity, Sigiriya rock fortress and the ancient cities of Anuradhapura and Polonnaruwa as well as a gateway to the east coast beaches. Visitors can tour Dambulla and enjoy scenic beauty in multitude of attractions and return for luxury relaxation at Green Paradise.